It is no secret that one of the biggest success factors for every startup is hiring the right talent. At Brizi, we are passionate about surrounding ourselves with the right people; people who want to build something big, are curious to learn something new, are leaders in what they are passionate about, and are humans who applaud and empathize with others. We know that “the strength of the pack is the wolf, and the strength of the wolf is the pack”. However, there is no easy formula for finding the right talent, especially in the startup world, where almost every startup can write a book on its hiring challenges. 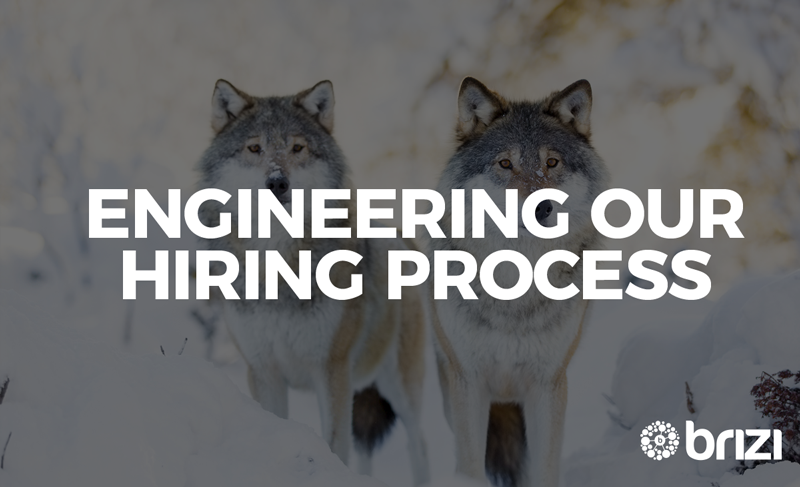 In this article, I will shed some light on and the steps we took at Brizi to design our hiring process to overcome some of the challenges in pursuit of building the right team. What did we need to solve? A startup neither has the human, nor the financial resources to compete with big tech giants in attracting top talent. The Googles of the world provide higher job security, more money – in the short run, and a more structured career path with mentorship. However, a lot of talent does not recognize the gains in joining a startup over a big company, like the potential accelerated financial reward of equity, the autonomy and ownership in defining their own career path, and the opportunity to learn through leadership. Startups have a lower exposure in the job market; everyone hears about how Google is a great company, but very few are aware of companies in the startup scene that may be just as great. A lot of talent consider having brand names on a resume is the only way to build credibility, however they dismiss the value of the accelerated learning and experience that a startup provides. When startups get exposure in the job market, they are considered a high risk opportunity. Not only because nobody is sure if the startup will be around in a year, but also because a small team can mean work relationships can get a lot more personal than in a big company. This requires a lot of homework on both sides – the startup and the talent – to decide whether those are people they want to work with. For a small team, there are a lot of conflicting priorities to balance, from building a product, to finding the right business model. There is limited financial resources to have a dedicated HR department, other team members have limited time to dedicate for recruiting, and outsourcing hiring is not ideal because of culture considerations, as well as the lack of a well defined hiring process. The team is one of the most important signals to investors about the startup’s ability to attract talent and make the right product and business decisions. Every new talent joining the team at early stages needs to be entrepreneurial, this means an ability to tackle an unending stream of problems quickly, inexpensively, and autonomously. Every new talent has a huge impact on the team, technically and culturally. Imagine a “bad hire” in a 1,000 employee company, it’s not a big deal. Now imagine the impact of a “bad hire” in a team of 10 people, that’s 10% of the company that isn’t contributing technically or culturally to the team, that’s not only a problem, it’s a disaster. Understanding those limitations and requirements, how can we best find the right talent for a company at our size and stage, while not dedicating undue human and financial resources? How did we design our hiring process? After doing some research, reading about hiring literature, and talking to other startups, we came up with the following three main changes in the design of our process. “If you cannot measure it, you cannot improve it”. We are true believers in this statement. Besides incorporating the most common metrics used to measure the efficiency of hiring, like conversion rates by stage and time to fill a position, we also defined a time to reject metric. This is the average time taken by our team before we identify that a candidate is not a good fit for Brizi. Since our team has limited resources, our target was to optimize for the time spent on interviewing candidates while not missing on good ones. In order to achieve this, we re-designed and standardized our interview process to become more efficient. In order to be aware of how much time we spend on each candidate, without the overhead of manually tracking it, we standardized the number and order of touchpoints, and the expected time spent on each part of the applicant’s journey. Application: This is our first filter – we ask the candidate to answer some questions about themselves to test for the requirement of entrepreneurial attitude, for example: “Tell us about something that you taught yourself in the past 6 months” and “Describe a time when you wanted something so badly you stopped at nothing to achieve it”. The application form helps us identify applicants who clearly do not invest the effort in answering the questions, which shows a lack of interest in the opportunity or a heightened sense of ego. Also in about 5 minutes, we can determine whether a candidate is the right fit for us through questions that test for specific traits that aligns tightly with our culture. Phone Screening: At this stage we spend 20-30 minutes to learn more about their career journey and how they aspire to grow. We also ask them few questions that focus on the cultural fit, besides a quick run through their technical skills. As you may notice, we identified cultural fit as our main reason for not extending an offer at the final stages. Accordingly, we decided to test heavily for cultural fit in our first two touch points. One of the questions we ask at this stage is “What are you not so good at or unwilling to do professionally?”, which gives us some insight on the candidate’s self awareness, ego, and alignment with the role they are applying for. Case Challenge or Technical Interview: Our third stage in the interview is a case challenge for business candidates, or a coding interview for technical talent. This interview takes about 60 minutes, and it focuses on the ability to think in a structured way, showcase the technical competencies, and impress the interviewer with the know-how. For example, for our Product UX Designer role, we created a case around crafting a Brizi experience in Paris to transform the city’s image from being a “city of romance” to a “sports capital of Europe”. The problem statement and the questions we ask in this case are a very realistic representation of what a designer at Brizi might work on. We found this to be the fastest way to assess whether the skillset of a designer is relevant to Brizi roles or not. Onsite Interviews: Our last touch point is back-to-back interviews where we dig deep on both cultural and technical skills. We address any red flags that were raised in the previous rounds. One of my favourite questions in our behavioural interview is: “Tell me about a situation where you had an assumption about how to do things better”. We use this question to assess the candidates approach to any uncertain decision they need to make. We look for people who display an ability to identify when they need to run an experiment, and are capable of defining and setting up the experiment to get a conclusive output. We continue to monitor our hiring metrics to adjust our touch points as we get better at identifying talent. In order to compare candidates without personal bias, we standardized our interview process using score cards, and a pool of questions addressing the different competencies that we are testing for. A great source on recruiting in general, and designing score cards in particular, is “Who” by Geoff Smart. This was our main inspiration when designing the interview process at Brizi. The first step for us was identifying the key competencies that we are looking for in each role, technically and culturally. In his book, Geoff talks a lot about how to identify those competencies. We laid out what each role is expected to add to the team, and accordingly focused on the key, non-negotiable, technical competencies for a candidate to be considered for that role. For example, for our Product UX Designer role we identified that we need someone who has experience with interactive installations, able to build FUN and memorable user experiences, and has the mindset of making design decisions supported by data findings. This drove how we designed our case challenge and the scorecard for that role. We use a 3 scale point system to assess each competency: 1 – No, the candidate does not have the skill; 2 – Yes, the candidate has the skill; 3 – Hell Yes! The candidate is impressive at this skill. At the phone screening phase for example, we do not pass a candidate that lose more than 2 points. Additionally, we went through multiple iterations of defining the culture we want to build at Brizi, what worked in the past and what did not work. We built the foundation of our cultural manifesto in a company offsite, where we had an open discussion with all team members about how they perceive the company now, and how they would like to see it in the future. Having a deep understanding of the company culture, helped us identify what behavioural questions to ask and what an ideal answer should address. What did we learn? What did we achieve so far? We learned a lot about our team, our culture, and the ways we can nurture this culture as the team grows. It is really hard to measure and track a hiring process when trying to do it frugally. We had to build our own internal tools, write some code, and have a lot of commitment to measuring it. It is extremely important to identify the areas of improvement in a new hire during the interview process. This way, the company can set the new hire better for success on the job. It also helps set the expectations right and improve communication after joining the team. As a result of the new hiring process design, we saved about 25% of the team’s time on interviewing candidates. We also increased our employee retention rate, and observed an ongoing improvement in terms of the quality among candidates we interview. The quality of our discussions around potential candidates also improved and became more objective, than subjective. This lead to more confident hiring decisions. Based on measuring different hiring metrics, we were able to identify which parts of our hiring pipeline need improvement, and we are able to run experiments/make changes and track their impact to decide whether to keep them or not. We basically transformed our hiring process to an internal product which will now be the driving force of continuing Brizi’s success!